As we finish off Nintendo third year on the market it’s amazing to look back at all of the great Game Paks that have released. We’ve come a long way from static black background single-screen games like Donkey Kong and Popeye, and it seems like with every passing month a new NES title comes out that impresses us even more than the last. Two third party licensees in particular have embraced the 8-bit console, pushing it harder than anyone else: Konami and Capcom. With vast arcade experience, these two powerhouses know how to squeeze every drop of processing power out of Nintendo’s little grey box, and with that not only comes detailed graphics and memorable music, but also innovative gameplay and bold experimentation. Bionic Commando from Capcom shows that being bold and daring can pay off dividends. Frequent arcade enthusiasts will recognize the name Bionic Commando, a sort of pseudo-sequel to the overhead shooter Commando (which also released on the NES). At the beginning of this game you’re dispatched to rescue Super Joe from the original, who has gone missing after trying to infiltrate the evil Imperial forces. If you don’t press Start at the title screen you’ll be treated to a nicely detailed cinematic explaining the story. So far this sounds like your run of the mill standard military shoot’em up, but as soon as you begin your adventure you realize that this is anything but. You start on an overhead map in a helicopter. You can select different numbered squares to pick where you want to land. The obvious first place to land is quadrant 1, and doing so you’ll parachute into the level, which is presented (as is most of the game) as a side-scrolling game instead of from an overhead perspective like the first title. The first thing that becomes clear is that your character cannot jump! This is highly unusual for a side-scrolling action/adventure game and this restriction is what makes this game so compelling. Instead of jumping, you’re equipped with a bionic arm, which functions like a sort of grappling hook. If you deploy it without pressing a direction on the d-pad the arm will fire off at a 45-degree angle, allowing you to grapple onto nearby objects and swing. Alternatively you can press up and Go-Go-Gadget your arm vertically to pull yourself up to the next platform. Pressing left or right while firing the arm will expand out horizontally from your character, allowing you to grab power-ups, grapple onto nearby items, or even push enemies right off a ledge to their deaths! As you can tell, the bionic arm is quite handy and highly functional, allowing for a wide variety of moves at your disposal at all times. Plus, it’s a heck of a lot of fun to swing like Spider-Man through the levels! Speaking of levels, the game is quite diverse with the variety of areas you get to explore. Many of them have you moving from left to right, as you’d expect, but there is often a sense of verticality to them as well. This means you can take alternate paths by grappling up to platforms above you, giving this game a sense of exploration that so many other games of this type lack (Rush ‘N Attack and Contra, for example, are way more straightforward). 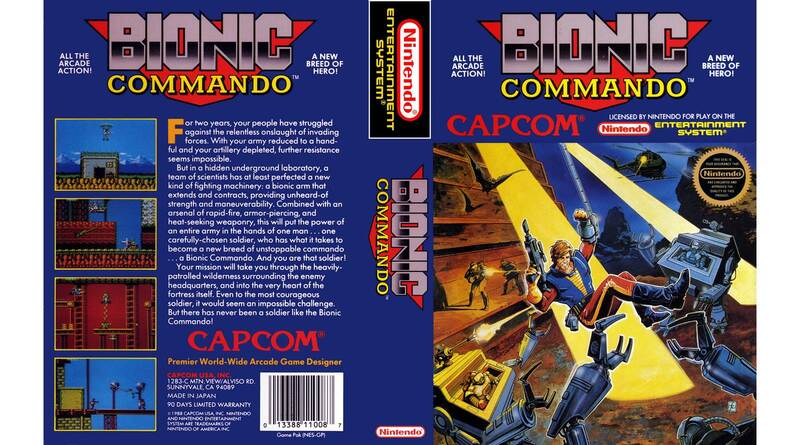 Because of this, Bionic Commando feels less like a run and gun action game, and more like an adventure title with secret communication rooms to discover and items to locate. You’ll be able to find new weapons and upgrade your maximum health to aid in your quest. You can grow stronger by collecting small bullets that appear after defeating enemies. When you acquire enough your maximum health bar will increase by one unit. This being a Capcom game, it can be rather difficult to conquer. However, if you’re willing to spend a little time in the first area you can sort of cheat the game and reach maximum health right away. All you have to do is enter the section where the elevator lifts are and the enemies come parachuting in. Simply kill them and collect their bullets, then move a little to the left or right and the enemies will once again fall down from the sky and you can take them out over and over again. After maybe five or ten minutes you will have maxed out your health and the game should be much easier. One of the features I love in this game is the ability to stage select at will. You’ll be able to visit the areas in any order you like, although some of them could be blocked or require a special item to proceed (like a flare to light up the dark corridors). Capcom pioneered this nonlinear stage design with Mega Man, and I’m happy to see something similar here. The game has spot-on controls, but they may take a little while to get used to. I found it difficult to wrap my head around not being able to jump for the first few levels of the game, but eventually it all clicked and I was swinging around with ease. Some of the later stages will require you to master this technique in order to progress, so keep practicing! I also appreciate that some of the areas of the game have multiple paths and an almost maze-like layout that requires some experimentation to proceed. While most of the game is side scrolling, there are overhead sections as well, which is a nice callback to the original Commando. This happens when you encounter an enemy truck on the overhead map, triggering a special stage where you have to shoot your way through a bunch of enemies. These areas are fairly short and they’re not something you should shy away from because very often you can acquire extra lives that will aid you on your adventure. Plus it’s kind of fun to swing your arm in a 360-degree circle, pushing the enemies back before you shoot them dead. If there’s one weak point it’s probably the game’s bosses, or lack thereof. Most of the game has you blowing up an energy cylinder at the end, and slightly more difficult enemies sometimes guard these. For the most part you’ll be fighting similar bosses over and over again, with little variety and thus no real need to learn new techniques. I found this to be a minor qualm and it didn’t really have a huge impact on my enjoyment, but I can see how some might find the lack of difficult bosses a turn-off. Without spoiling anything, I will say that the end boss fight is quite epic and the ensuing ending animation is quite spectacular and surprising that it made it through Nintendo’s rigorous approval process. Graphically Bionic Commando is quite detailed and there are plenty of different enemies throughout. You’ll come across your normal thugs, as well as a bunch of cool looking baddies, like a dude with a backpack that has a bionic arm like you do. From demolition experts that throw bombs at you, to turrets that try and take you out, you’ll find plenty of great looking sprites here. The backgrounds are bright and colorful and you’ll find yourself exploring caverns, secret hideouts, outdoor locales, and more. The game also features largely drawn and highly detailed characters in small cutscenes that really brings the story to life. As is typical with many NES titles, there’s a fair share of screen flicker when too many characters appear on screen, but it’s something we’ve come to expect and it’s not too egregious here. The sound design is fantastic throughout the game. From the unique sound effect of your bionic arm to the various rat-a-tat sounds emanating from the weapons, it all sounds great. The soundtrack is also memorable and will stay in your head for days and weeks after you’ve shut off the NES. There are several different tracks that play depending on the stages and none of them got to the point of being annoying in the slightest. The variety is enough to keep the adventure fresh throughout the entire game and the composition features unique instrumentation adding to the military aesthetic of the missions. If you’re looking for a fun action/adventure game with a completely original and unique take on the genre, then look no further than Bionic Commando! Is it a perfect game? Hell, no – far from it! There are a plethora of spelling errors and grammatical problems throughout and the instruction book is no help either. However, the game is pretty straightforward enough to figure out what’s going on despite those problems. The bottom line is there are a wide array of levels to play through, places to explore, items and weapons to use, but the real star of the show is your bionic arm, which is really fun to use throughout the entire game. What could have been a gameplay disaster has turned into a breath of fresh air. Capcom has yet another hit on its hands and just wait until you make it to the end segments – it’s quite spectacular. This one’s worth your time!